Prior service; Subaltern and Captain; 66th Regt., Princess Louise Fusiliers; 2 years, 7 months, on garrison duty at Halifax, N.S. 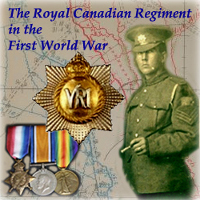 Ten months service in the field with The R.C.R. War Diary of The R.C.R. for November 11, 1918 - "MONS At about 09.00 hours a signal message as attached was received stating that all hostilities would cease at 11.00 hours etc. The news was sent to Companies and soon spread among the civil population as well. Thus for us the war ended in almost exactly the same ground that the British Army had made their first stand in 1914. Our men were in MONS. One platoon of "A" Company under Lieut. W.M. KING had been the first to reach the square in the morning and the platoon commander had inscribed his name in the "Golden Book of MONS". In the afternoon the Corps Commander made his official entry in to MONS, part of "A" Company contributed to the Guard of Honour. Battalion Headquarters moved to MONS in the evening." KING. Col. William Martin, O.B.E. (1946), E.D. ; manufacturers' agent; b. Halifax. N.S., 6 May 1894; s. Lieut.-Col. Andrew and Willa Louisa (Zwicker) K.; e. pub. schs., Halifax. and Halifax Co. Acad. (matric. ); m. Marjorie Taylor, d. Arthur Stanley Mackenzie, Ph.D., LL.D., F.R.S.C. (former pres. Dalhousie Univ. and an original mem., Nat. Research Council) of Halifax, 18 Sept. 1924; children: S/Lt. Stanley M., R.C.N., Andrew M., Maryan T.; PARTNER, HAR-KING & CO. (estbd. 1947), London, Ont. ; dir., Robin, Jones & Whitman Ltd., Halifax. N.S. ; with Bank of Montreal 1911-15; entered employ of James Fraser (estbd. 1878). Halifax, N.S., steamship agents and exporters 1919: became owner and mgr. 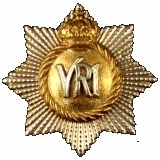 of this firm 1927 and continued its operation until 1946 when it was liquidated as a result of changed conditions brought about by the war; served in World War 1915-19; Lieut., Roy. Candn. Regt. 1917-19. France and Belgium; led first troops into Mons early morning 11 Nov. 1918; officially recognized as first Allied offr. to enter Mons; served in Candn. 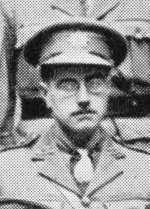 Mil; 1919-39; Lieut.-Col. commdg. Princess Louise Fusiliers 1930-35; Col. commdg. 17th Inf. Bgde. 1937-39; served in World War 1939-45; apptd. Depy. Asst. Adj. Gen. M.D. 6. Halifax. N.S., 1 Sept. 1939; Asst. Adj. & Q.M.G. (1st Grade Staff Appt.) M.D. 1, London, Onto 1943-46; retired with rank of Col., May 1946; mem.. Candn. Inst. Internat. Affairs (past pres. Halifax Br. ); Anglican; recreations: riding. fishing; Club: London; Home: 831 Richmond St., London; Office: Richmond Bldg., London, Ont. KING. Col. William Martin, O.B.E., E.D. ; manufacturers' agent; b. Halifax, N.S., 6 May 1894; s. Lieut. Col. Andrew and Willa (Zwicker) K.; e. Pub. Schs., Halifax and Halifax Co. Acad. ; m. Marjorie Taylor, d. Arthur Stanley Mackenzie, Ph.D., LLD., F.R.S.C. (former Pres. Dalhousie Univ.) of Halifax, 18 Sept 1924; two s. and one d.; MANAGER AND PROPRIETOR, HAR-KING CO., mfrs. agents and distributors; Extve. Vice-Pres., Webster Wire Ropes Canada Ltd., Halifax, N.S. 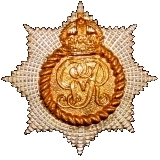 ; served in 1st World War 1915-19; Lieut. Roy. Candn. Regt. 1917-19 France and Belgium; served in Candn. Militia 1919-39, Princess Louise Fusiliers; served in 2nd World War, 1939-46; Administrative Staff, various appts., A.A. & Q.M.G., M.D.I. London, Ont., 1943-46; mem. Candn. Inst. Internat. Affairs; Anglican; Clubs: Halifax; Royal Nova Scotia Yacht Squadron; Home: 5623 Point Pleasant Drive, Halifax, N.S. ; Office: 611 Bank of Nova Scotia Building, Halifax, N.S. Colonel William Martin King died at the age of 75 in Halifax, Nova Scotia. A member of the Regiment during the First World War, he was the first British officer to enter Mons, 11th November, 1918.